Originally written for DVDTalk.com as part of a review of the Alfred Hitchcock Premiere Collection. Considered by Hitchcock to have been his first real movie, this silent chiller is based on a novel by Mrs. Belloc Lowndes. The book of The Lodger is an early entry in the extensive Jack the Ripper lore, and one of the very first pieces of fiction to try to offer a solution in the case. This movie version never mentions Jack, instead showing us a similarly styled killer calling himself "The Avenger." Every Tuesday night for several months, the Avenger has murdered a fair-haired woman and left behind a mysterious calling card featuring his moniker inside a triangle. Thus, suspicions are high and nerves are on edge when an odd new tenant moves into a rooming house near where the latest killings have taken place. Jonathan Drew, played by early British film star Ivor Novello, keeps to himself and has several "queer" habits, such as demanding all the portraits of women be taken out of his room. (There seems to be some implication that he isn't just "queer" as in "weird," but the landlady also suspects he is gay.) If Drew is the Avenger, though, he's picked a rather bad place to set up shop. While the landlords' daughter, Daisy (Marie Ault), would make a perfect candidate for the next victim, her suitor (Arthur Chesney), is a police detective on the Avenger's trail. Naturally, Drew's odd behavior endears him to Marie while alienating everyone else, and the next Tuesday, the cop will make his move. 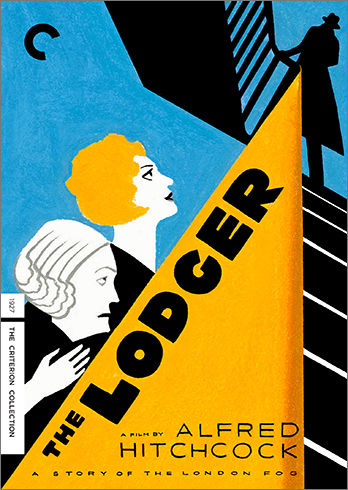 The Lodger has several telltale Hitchcock moves, from the innocent ingénue being drawn to dark forces and the resulting romance to the theme of a man being wrongfully accused. There are snooping neighbors, ostentatious settings (Marie is a clothes model), and several red herrings and deceptively tense sequences where all is not as it initially appears. The movie is an effective character piece, well constructed by the young director. He manages to draw convincing, demonstrative performances from his actors, and Hitchcock is also already experimenting with mis-en-scene and other conventions of film language. Of particular note are his creative title cards that mimic theatre marquees and announce characters in a visual equivalent to signature motifs we often hear in film scores.